I love the idea of building houses for people in need. However, being a full-time parent to two small children kind of limits my ability to spend a month in an impoverished country building houses for the homeless. So I found another way to offer my support and perform my next good deed. Those dedicated people who do sacrifice their valuable time building houses for the homeless need to eat. 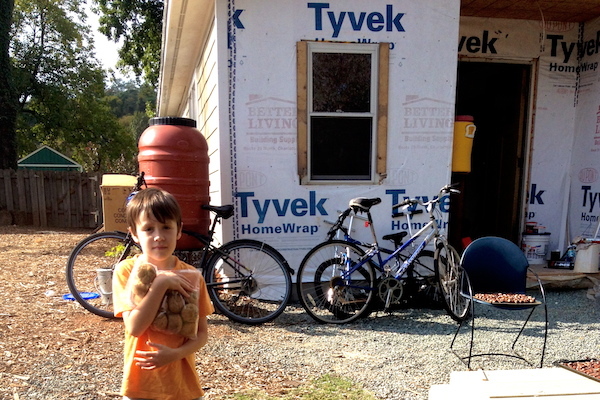 So my son and I made muffins and brought them to a team of people renovating a house in our area. We were greeted with kindness and appreciation. And we were offered a tour of the houses. Even though we weren’t able to join in on the construction, my son was able to get an understanding of the important work that was happening. He was really excited by the idea that a family without a home would soon have a place to stay. You can support a charitable building project in your area, whether it is by donating food, providing building materials or lending a hand. Visit Habitat for Humanity for volunteer opportunities close to you.